Chief Justice Myron T. Steele of the Supreme Court and Chancellor William B. Chandler, III and Vice Chancellor Leo E. Strine, Jr. of the Court of Chancery were named on the 2008 list of the most influential people on corporate governance by Directorship Magazine. Chief Justice Myron T. Steele of the Supreme Court was also elected to a three year term on the Board of Directors of the Conference of Chief Justices. The Conference of Chief Justices is a national organization that serves as the primary representative of the state courts before Congress and federal agencies. Chief Justice Myron T. Steele, Vice Chancellor Stephen P. Lamb and Vice Chancellor Leo E. Strine, Jr. were named among the top 500 leading lawyers in the country in the fall 2008 edition of the Lawdragon 500 Leading Lawyers in America. Lawdragon, a legal online publication, combines online balloting and legal research to select its list of the top attorneys in the country, including private attorneys, law professors, judges, among others, who have demonstrated leadership, sustained achievement in the field, and outstanding reputations. Justice Randy J. Holland of the Supreme Court was appointed to the American Bar Association Presidential Commission on Fair and Impartial State Courts. The fifteen-member Commission is charged with convening a National Summit on Fair and Impartial State Courts in May 2009 to identify and meet challenges facing state courts in serving the public. Justice Jack B. Jacobs of the Supreme Court delivered a paper entitled “Developing an Infrastructure for Hostile Takeovers: The Delaware Experience” at the Symposium on Hostile Takeovers in Tokyo, Japan on December 12, 2008. The paper will be published in both English and Japanese in the University of Tokyo Journal of Law. In addition, Justice Jacobs visited The Harvard Law School in the fall 2008 as the 2008 Distinguished Visiting Jurist of the Program on Corporate Governance. Justice Henry duPont Ridgely of the Supreme Court was elected to the House of Delegates of the American Bar Association (ABA). The House of Delegates is the policy making body of the ABA. Vice-Chancellor Leo E. Strine, Jr. of the Court of Chancery wrote an article entitled Breaking the Corporate Governance Logjam in Washington which was published in the August 2008 issue of the Business Lawyer. Vice-Chancellor Donald F. Parsons, Jr. of the Court of Chancery was named President-Elect of the American College of Business Court Judges at its annual meeting. The organization consists of approximately 100 business or commercial court judges from twenty states. 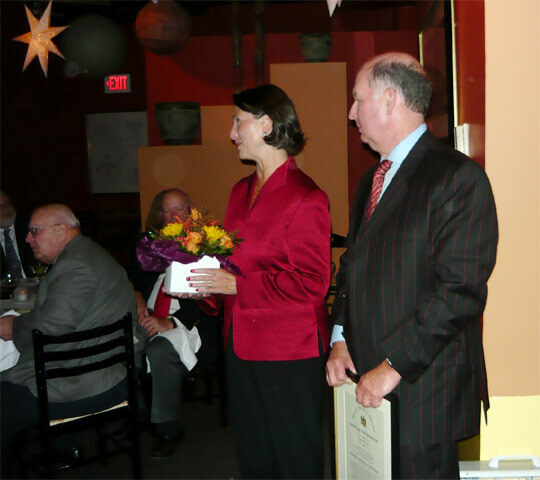 Chief Justice Myron T. Steele honored retired Judge Susan C. Del Pesco of the Superior Court with a gift and a certificate of appreciation at the 2008 Fall Judicial Education Conference. Judge Susan C. Del Pesco, who retired from the Superior Court in June 2008, was recognized by Chief Justice Myron T. Steele for her twenty years on the bench at the annual Judicial Conference meeting in September 2008. Judge Joseph R. Slights, III of the Superior Court was recognized for his outstanding service to the Judiciary, his work as co-chair of the 2008 National High School Mock Trial and his work on the asbestos litigation caseload by Chief Justice Myron T. Steele at the annual Judicial Conference meeting in September 2008, where he was presented with a gift and certificate of appreciation. Judge Richard F. Stokes of the Superior Court received the 2008 Distinguished Mentoring Award from the Delaware State Bar Association on October 22, 2008. This award recognizes a Delaware lawyer or judge who, by mentoring, has served as an inspiration and model. Master Daniel M. Kristol of the Superior Court received the Outstanding Service to the Courts and Bar Award from the Delaware State Bar Association. Superior Court welcomed new Judge John A. Parkins, Jr. and new Commissioner Lynne M. Parker to the bench. Judge William C. Carpenter, Jr. of the Superior Court was recognized by the American Bar Association for two years of service on the executive board of the National Conference of State Trial Judges. He will continue as chair of the Judicial Division Membership Committee. Judge Calvin L. Scott of the Superior Court serves as a member of the by-laws committee of the Conference. Family Court welcomed new Commissioner Bernard Pepukayi to the bench.